Over a month ago, I started a book blog called Sultry, Steamy Reading. For all intents and purposes, I really did want the blog to grow in readership. I wanted to be a part of an online community whose members liked the same kinds of books I read. For those who don’t know me too well, I love to read. I could stay up the whole night reading. I could finish one entire book in a night’s worth of reading. However, I consider reading my escape and stress reliever after all those hours of working hard and being in front of a computer. Therefore, I read mostly romance novels. I mean, I like all kinds of books, but the romance genre has given me what I look for when I’m lying in bed and still awake way past my bedtime. It has given me a kind of satisfaction that I haven’t found in other genres. That’s what I wanted for SSR. I wanted to find a group of book bloggers who read similar books as I do. I would say that I am halfway successful in getting the blog out. The twitter account I created for it has been getting messages and favorites from published authors. Its followers consist of authors, book tour companies, and other book bloggers. The blog stat is good. There’s still a long way to go, but it’s pretty good for me right now. Which brings us to this moment. I realized that I may need another book blogger to share the blog with. There are just so many books to read out there and I won’t be able to keep up. At this rate, I’d be so behind that the books I put up won’t be new books anymore. I wish I had friends who were also into the romance genre as I am and also into blogging as I am. I also wish I’d meet a new friend online, and that we’d click, and we can set up SSR together. Oh well, if you happen to come by this blog and read this and know of someone, please do refer them to me. I’d really like to expand my horizons, and I’m looking forward to meeting fellow book geeks. I am really glad because there are people that I have met here in WP that I would not have met any other way. I am glad for their friendship. They welcomed me into a community where I can express my most poetic side. They have been very avid supporters. That is also why I am such a supporter of their works and their blogs. Because they have been so nice to me from the very beginning, I would like to give them this token of appreciation. I hope that they get to see this. I also hope this brightens up their day, one way or another. Tomorrow is yet another Thursday. I already have the poem done, but I won’t post it until tomorrow. I am also supposed to prepared my acceptance and nomination for the Perfect Poets Award. I still don’t know who to nominate. I will have to read through the poems tomorrow and see whose poem will strike a chord within me. I am really excited for tomorrow. I have not been writing a lot of poems lately, but I always make it a point to have one poem ready every Thursday. It’s really a great thing that Jingle started this rally. It has been 18 weeks now, and the community is stronger than ever. There are other members I have not seen anymore, but I am glad that I got to know them through the rally. I am also very happy to meet these new poets that Jingle has found. I know I will really have a great time reading through a lot of poetry tomorrow. I know I have been pretty absent lately, but I am so glad to be blogging again. These absences may occur again in the future, as I also want to focus on being a freelance writer. I may appear like I am spreading myself too thin. 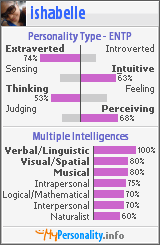 However, I am amazed at myself sometimes because I never knew I was good at balancing things. At least, I know when and where to compromise. I am so thankful I have blogging friends who still take the time each day to visit my blog and check on me. I am going to do them a favor today, and drop by their blogs too. 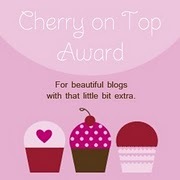 I want to thank Jingle because she has given me yet another award for my blog. 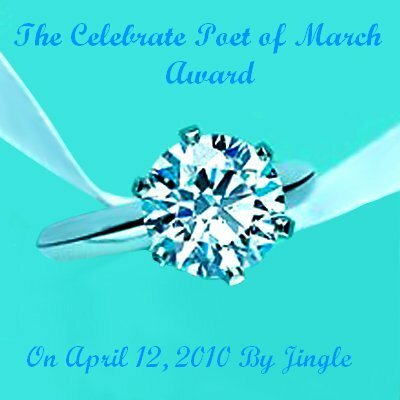 I am not going to pass this on to anybody right now because I feel like all my poet and blogger friends also have their own award from Jingle’s blog. If any of you haven’t had any award to decorate your blog with, I would gladly give you one of mine.